This 10-pack of replacement sponge inserts will ensure that you always have fresh replacement sponges. Over time tDCS sponges will loose their integrity, causing uneven current distribution and less effective tDCS sessions. We recommend replacing sponges every two weeks, or once every 7 tDCS sessions. 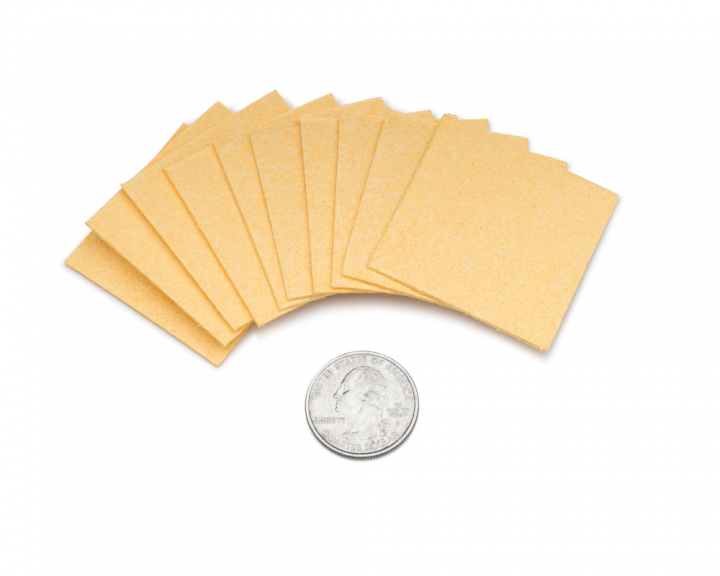 These 2×2″ sponge inserts are used to replace the original sponges that come within 2×2″ Amrex Sponge Electrodes. Additionally, these sponges can be used by themselves as makeshift electrodes by using our Alligator Clip Electrode Cable (or Alligator Clip Adapters if you have one of our older products). Over time the sponges within Amrex electrodes can grow brittle and crumble, crack, or split causing an uneven distribution of current, reducing the effectiveness of tDCS. Additionally, worn-out sponges can cause an uncomfortable tDCS session, with increased tingling, itching, and sometimes mild stinging sensations occurring. Therefore, it’s a good idea to replace your sponges regularly to ensure your electrodes function properly. Through our own real-world testing, we have found that it is best to replace tDCS sponges after two weeks, or every 7 tDCS sessions. However optimal results can be obtained by using new sponges for each session.